They say history repeats itself and it does because we, the “intelligent” human race refuse to learn ! On March 14th, Krishnan and I went to watch this movie made on Subedar Paan Singh Tomar. He was an army man and held the 3000 mts Steeplechase record for almost a decade in the 50s. He also won medals for India in the Asian games. Just because, then too, in the refreshing newness of our independence, he was cheated out of his piece of land, he becomes a much feared bandit. He is finally killed in 1981. Cut to 2011 and the photo below shows nothing different than what happened to Paan Singh Tomar. 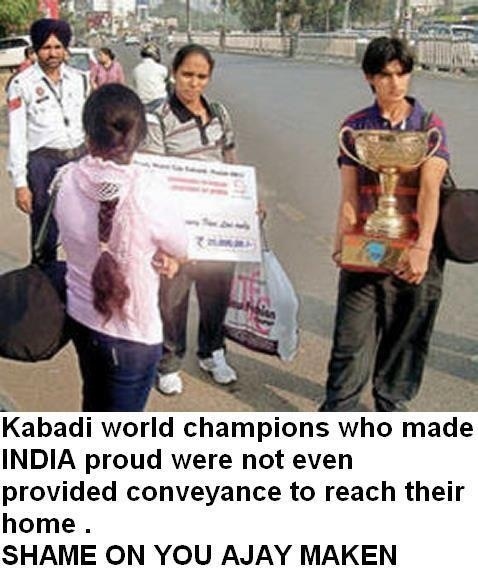 Kabbadi originated in India and like Chess, we don’t care much for it, but our team won the world championship and did not even get conveyance !!! Contrast that to the euphoria over Sachin Tendulkar’s 100th 100 – it’s not a mean feat to be the only person in history to have done it and Sachin is truly a great sportsman, but so is Grandmaster Vishwanathan Anand !! At the end of the movie you have a list of great sportsmen who have brought glory to our nation and have died in penury or worse, had to sell off their medals to make ends meet. In all the gloom, the bright spark is Irfan Khan’s acting – he is just brilliant, WOW !